A demonstration of support for Black youth at Milwaukee’s Sherman Park quickly turned into a confrontation between law enforcement officers and community members after an African-American teen was taken into custody by Milwaukee police. The incident, which occurred shortly after 8 p.m. Thursday night, involved a Milwaukee County Sheriff’s Deputy and two Milwaukee Police Department (MPD) officers approaching a group of teens who were playing music through a speaker and dancing near the Sherman Park playground just south of West Burleigh Street. There were about 80 people present, including state and local elected officials and individuals from the City of Milwaukee Office of Violence Prevention. A number of law enforcement vehicles and clusters of officers had surrounded the area occupied by the group, even before the incident occurred. According to MPD Officer Steve Basting, the law enforcement officers asked the teens to stop the music because it was too loud. “One police officer came over in a defiant mood, [and said], ‘You gotta go.’ We asked them (the children), ‘Okay, move to the center (of the playground) over here.’ He (the officer) says, ‘No, they can’t even do it over there,’” Nixon said. Gabriel Moses, 34, a resident of the area, corroborated Nixon’s account. “His back was to [the officer]. It was like three or four police on their bikes,” she said. She said, as the young man was leaving, the officer, whose identity has not been confirmed, threatened to arrest him if he said anything else. A Milwaukee Stories reporter observed MPD officers tackle the young man, who reports said was as young as 14 or 15 years old, from behind while on his bicycle. The crowd of bystanders and additional law enforcement reacted quickly to the incident, swarming to where the officers and young man had gone down. Leaders of the group, including elected officials, city officials, members of the Black Panthers and others, helped to de-escalate the tense situation. Though one 13-year-old boy was hit in the jaw when attempting to pull others away from a police car, no one else was detained by law enforcement. The crowd was ordered to return to the playground area, which it did. By then, there were at least 20 squad cars and more than 50 law enforcement officers in the immediate vicinity. Milwaukee police and sheriff’s deputies create a wall about 30 feet south of the Sherman Park playground. Maria Hamilton, the mother of Dontre Hamilton who was shot and killed by a Milwaukee police officer in 2014, said she spoke with a Sergeant at the scene who informed her the young man had been taken to the District 7 police station. A District 7 Lieutenant Charles, who declined to give his first name, said he was “not aware of anybody who’s been taken into custody” and declined to confirm any details including the child’s age, charges, whether he had been released and who the officers involved were. Reports at the scene indicated the boy had been arrested and charged with disorderly conduct. David Muhammad, who was involved in organizing the demonstration, said the event’s original intent was to be a “holistic response to community trauma.” Muhammad, a violence prevention manager with the City of Milwaukee Health Department, said the events of Wednesday night — when it was reported that a large group of youth were involved in a violent standoff with police in riot gear — were the result of young people not having productive outlets for their energy. Marlyn Tinsley, with the Milwaukee County Sheriff’s Office, said the children at the park on Thursday were not the same ones involved in Wednesday’s incident. Muhammah also said the youth may simply not know the best way to properly engage with law enforcement, or each other. He said it’s important for the older generations to show them love and respect and listen to their needs. At the same time, William Muhammad, a student minister at Muhammad Mosque #3, implored the youth, after Thursday’s incident, to act with restraint. By 9 p.m. a light rain had begun to fall on Sherman Park, and the crowd started to disperse, while law enforcement vehicles, some with their lights off and some on, continued to surround the area. All Milwaukee County Parks close at 10 p.m.
Before the incident, police and sheriff’s deputies look on from the park. 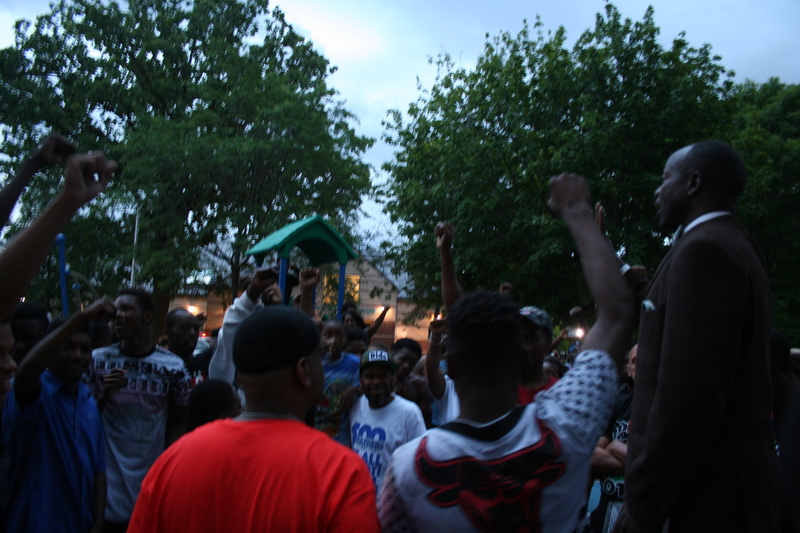 A group of about 80 people, including elected and appointed officials, gathered in Sherman Park as a show of solidarity with youth. The youth who was detained, before the incident. Sheriff’s Deputies look on before the incident. King Rick and other Black Panthers speak with officers from the Milwaukee County Sheriff’s Office. MPD officers tackle a Black teen Thursday night in Sherman Park. Commotion immediately following the incident. Law enforcement officers make a wall near the Sherman Park playground after detaining a Black teen.